If you're learning 3D character modeling, this book might be for you. Specifically, it deals with modeling and animating the head. Jason Osipa has written a very good step-by-step tutorial book. In short, this book is about modeling and rigging the face. Modeling will include creating the head with the different blend shapes for the mouth to simulate visimes. There's not much on texturing and rendering. For texturing, it teaches enough to get the basic UV mapping right on the face. The tutorials have plenty of accompanying screenshots with clear descriptions. I have absolutely no problems following along. All the chapter files are located in a CD provided. The software package used is Maya. The instructions written are not tied to any specific Maya versions, meaning it will remain timeless unless 3D conventions are changed (e.g. polygons are not called polygons in the future). Users of different versions of Maya should have no problems following along. Users of other 3D programs will have to take note that the blending and weighting tutorials are used with a Maya interface. That might make following hard or impossible, but I'm speaking from a I-only-know-Maya perspective. As for modeling, the lessons are universal and can be followed with any 3D software. But most 3D instructional books already have human modeling tutorials. This book is suitable for beginner to advanced users. 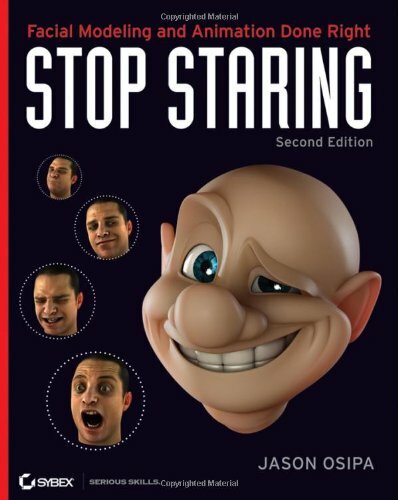 It's a very good book for learning in depth facial modeling and animation. Maya users will gain the most from this book.